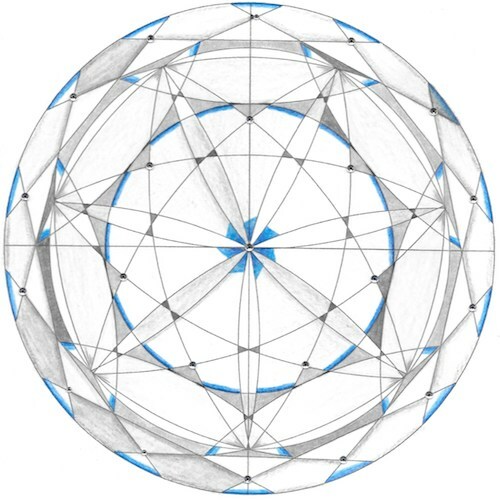 And as I pondered this Sagittarius mandala, created by Sandra Mosely, I saw a diamond with its intricately cut layers. There is a lot to a diamond. Without light it’s really not much. But in the presence of Light and in the hands of a master a chunk of crystalized carbon can truly dance. I primarily used white and shakes of grey, but then added some blue (the color of the spectrum for Sag). Blue symbolizes safety, peace and calm. To finish the mandala I used strategically placed adhesive rhinestones to give it some bling! Seven is also very prominent. Seven almost mandorla-like shapes create very narrow mandorla-like gates as seen in the seven petals anchored at the center or on the table of the diamond and extend into the crown area of the diamond. In the outer ring, fourteen lines create create the girdle of the diamond. “In the Tarot number fourteen is the card of the Temperance. Temperance shows reasonableness and self-control. The Temperance card is associated with Sag. Early in the cycle I found myself hitting a wall and was later challenged by a bad cold. Self care took the form of more sleep and forced boundaries determined what I could and could not do. Even my workouts came to a screeching halt. My body said, “Enough, already!” as it does every year at this time. I pondered what this was all about and decided to get to the bottom of it. I had downloaded a free E-book by Jessica Ortner earlier in the year. 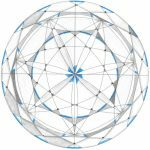 Using Tapping or the Emotional Freedom Technique (EFT) I tapped my way out of some things that were holding me back. It was very beneficial! At the end of the cycle I began to audition guiding words for 2017. “Precious” it is! I was hit over the head with it twice on Christmas Eve. Nothing like a good, tear-inducing validation. 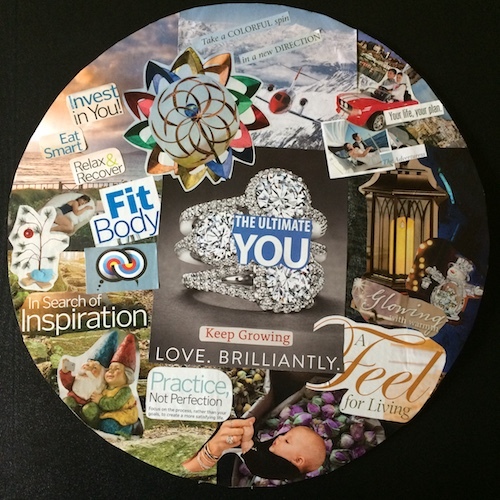 On the 27th I sat in silence and created my dream board, allowing Spirit to guide me as I cut, placed and pasted. Like last year’s, it speak volumes to me. The flavor of this board is so different than last year’s…there’s a softness, a tenderness, a warm-hearted-ness here that I have been feeling for some time. I still feel a bit like the Charlie Brown Tree on the left, but even though there’s still a “plate spinning in the air,” where I’m being led this year excites me. I’m in the driver’s seat (upper right) and something new is brewing (top center). The health of my body is still a priority but other fish are in the fryer this year. The diamonds in the center represent me at my best, in body, mind and spirit. Grounding me are my parents (the gnomes on the bottom left), the reminder that Practice, not perfection creates a more satisfying life. The infant speaks to me of the word “Precious” and the nature of my infant-like connection to God (the faceless, ,bodiless hand). I am being pulled toward a “feel for living” (rather than thinking) and to be a person that glows with warmth – both more heart centered. I have friended heArt-ist Donna Drozda. What a remarkable woman is she! And she is offering a gift! Connect with her on Face Book or connect to her blog, email your month and day of birth to her and she’ll send you a two page Personal Year Energy PDF. I was amazed at how much her report spoke to what my spirit had already told me through my dream wheel! My challenge word for the year is Sparkle… like sparkle and shine – no matter what comes down the pike. I think of my sister Karla especially – a Sag born 14 months after me. She is a riot! Light-hearted, loves a good joke and a good time. There was always a party going on with Karla. The party started first thing EVERY morning when we were growing up as the dance music blared from the bathroom. Being the quiet-loving soul that I am it drove me absolutely crazy then. But, I appreciate the charm and light-heartedness she brings to my life. Symbolically she tells me to lighten up! And maybe that’s what the sparkling is all about. May Love, Light and Joy be Yours!